What is an Inspection Contingency? Definition: An Inspection Contingency is a clause in a home purchase & sale contract which provides the buyer an opportunity to conduct a home inspection, with the right to either terminate the contract, or attempt to negotiate repairs and/or terms of the contract, based upon the results of an inspection report. Contingencies for home inspections vary from state to state, and the methods of negotiating issues can also vary by "local custom" depending on the market area. For example, in Texas, inspections are handled during the "Option Period" - typically a 10-day period in which the buyer pays a nominal fee in exchange for this option. In some areas, such as on the East Coast, it's also common for home inspections to be performed prior to entering into a purchase contract. Such a scenario can also happen in the Seattle area when the market is exceptionally competitive with multiple offers, which is known locally as a "Pre-Inspection." In Washington state, the Inspection Contingency is handled in a formal manner via the purchase & sale contract. In the NWMLS (greater Seattle metro area), a licensed real estate agent will likely accommodate for this process using a "Form 35 - Inspection Addendum to Purchase & Sale Contract." Fortunately for both home Buyers and Sellers, the procedure for handling the property inspection process and subsequent negotiations is typically spelled out clearly in the contract and optional inspection addendum. 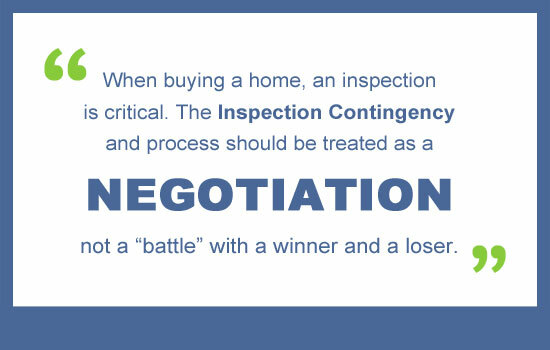 What are the Steps in an Inspection Contingency? Generally speaking, the inspection process in every contract will follow a similar outline, which will vary by state and/or market. 1. Hiring a Home Inspector: The inspection period is usually specified in days, and most likely is negotiable between the Buyer & Seller. In the Seattle area, the default is 10 calendar days, but in a competitive real estate market, we usually recommend reducing this to 5 business days (or less, if the preferred licensed inspector is available) in order to keep the offer as competitive as possible in case of multiple offers. 3. Review the Inspection Report: The Buyer can usually expect to receive a professionally written report within one day, detailing any issues they've discovered. The Buyer has the option to either approve the report as is, thus waiving the inspection contingency, to reject the report and terminate the contract, to negotiate repairs or Seller concessions (usually financial terms), or a combination of repairs and concessions. No matter the location or local customs, negotiating inspection report items can be a bit like walking a tight-rope. On one hand, the Buyer is of course justified in seeking repairs for any issues which concern them. On the other however, it's important for the Buyer (and seller) keep a level-head during this time, to prevent an otherwise normal transaction from becoming "adversarial" - which in itself, can kill a deal. Remember, in the vast majority of cases, the Buyer is purchasing a used home - and thus, should not expect every aspect of the home to be in like-new condition. Of course, if there are major home systems or appliances which are not functional, poorly maintained, or at the end of their useful life, then those items should always be considered & negotiated accordingly. In short, keep in mind this is a "negotiation," and not a "battle" where there is a winner & a loser. During this phase of negotiations in particular, the buyer should carefully consider the advice of their real estate agent. A good agent will of course want the client to be happy with their home purchase - and thus should not knowingly recommend glossing over issues which are likely to be in need of immediate repair (according to the inspector). The agent will also be able to help prioritize the issues, guiding the client to the best course of action on each matter. It's also worth noting, that the agent should be keenly aware of the "pulse" of current market conditions - because depending on the status of the market, the agent's recommended negotiation strategies will certainly change. In the Seattle market, inspection negotiations are typically handled via the "Form 35R - Inspection Response for Form 35" which is used in conjunction with the terms of the original Inspection Contingency. When utilizing this form, the Buyer will either terminate the contract, request the seller make repairs, request modifications to the contract (i.e., price or financial concessions), or a combination of repairs & concessions. It's important to note, that at this point, the Buyer has little to lose in at least asking to negotiate - the worst that could happen, is the Seller will simply refuse, throwing the ball back in the Buyer's court (the seller cannot terminate at this point). However, remember this isn't a "contest." If the Buyer truly wants the home, and is legitimately concerned with any inspection items, it's best to be as practical & constructive as possible with repair and/or contract modification requests. Upon receiving the Buyers inspection response, the Seller can either agree to the proposal, request an alternative solution, or refuse the buyer's response in total. If the Seller agrees to the buyer's proposal, then the Inspection Contingency is satisfied, and the parties agree to proceed to closing as normal. If the Seller suggests an alternative solution, the Buyer then has the option to accept those terms, or to terminate. The Buyer does have the option of suggesting yet another solution - however in doing so, the Buyer will VOID the Seller's proposal - meaning, the Buyer could end-up receiving no repairs or concessions at all. So, tread carefully in this case. Watch the calendar! The real estate agents on both sides of the transaction (and their clients) need to pay close attention to the calendar during the entire inspection process. Many buyers accidentally waive their Inspection Contingency simply by miscounting the days (or even hours!) at every step in the process. Time is of the essence. Once the inspection process and negotiations have been handled, the parties can usually look forward to a successful close - barring of course, any surprises with the financing contingency or other contractual matters. At this point, the Seller usually starts (or finishes) packing, and the Buyer looks forward to moving into their new home. Be advised however, that in many cases, the contract allows the Buyer the right to re-inspect the home prior to closing - this includes any inspection repairs, and a general walk through a few days before closing. Always keep in mind, that buying a home is not a done deal until the loan has funded and keys are provided - and in Washington State, documents must also be recorded before possession - usually the afternoon of closing.